Steve graduated from the University of California at Santa Cruz in 1998 and has lived in Tucson since 2002. Steve has worked for a number of Arizona environmental, labor and civic participation organizations to secure a just, accessible and sustainable future for all of us. Most recently, Steve was the Executive Director of the bi-partisan environmental advocacy organization, Arizona League of Conservation Voters, where he served from 2005-2013. Steve works on environmental issues; including water, open space, and sustainability, arts & culture, bicycle and pedestrian issues & historic preservation. Vera was born in San Manuel, Arizona and grew up in the mining town of Mammoth. She spent two years at the University of Arizona and in 2007 received a liberal arts associate degree at Pima Community College. Previously she taught pre-school, kindergarten and was Assistant Director for St. John the Evangelist Catholic School. Vera has a beautiful seventeen-year-old daughter, Marysol. She is active in the community as a volunteer coach for girl’s volleyball, basketball, and as a math tutor and board member at St. John’s. She has lived in Ward 1’s Westside for the past 16 years, and currently serves on the board of the Tucson Mountain Little League. Nathalia worked as a waitress in several local Tucson restaurants until she graduated from the University of Arizona earning a B.A. in Political Science with a minor in Philosophy. Post-graduation, she joined the team of organizers for Proposition 206, the Fair Wages and Paid Sick Leave initiative approved by Arizona voters in 2016. After Prop 206, Nathalia came to work at the Ward 1 Council Office as a Council Aide for Council Member Regina Romero. In addition to her work at Ward 1, Nathalia is a community coordinator for the annual El Tambó Fest, working with local artists and activists to put together an annual cultural fest in downtown Tucson’s historic Hotel Congress. She is currently pursuing a Masters in Urban Planning at the UA’s College of Architecture, Planning and Landscape Architecture (CAPLA). Marisol Flores-Aguirre, EMBA, is an experienced mission driven executive with a talent for driving innovation, community building and problem solving. 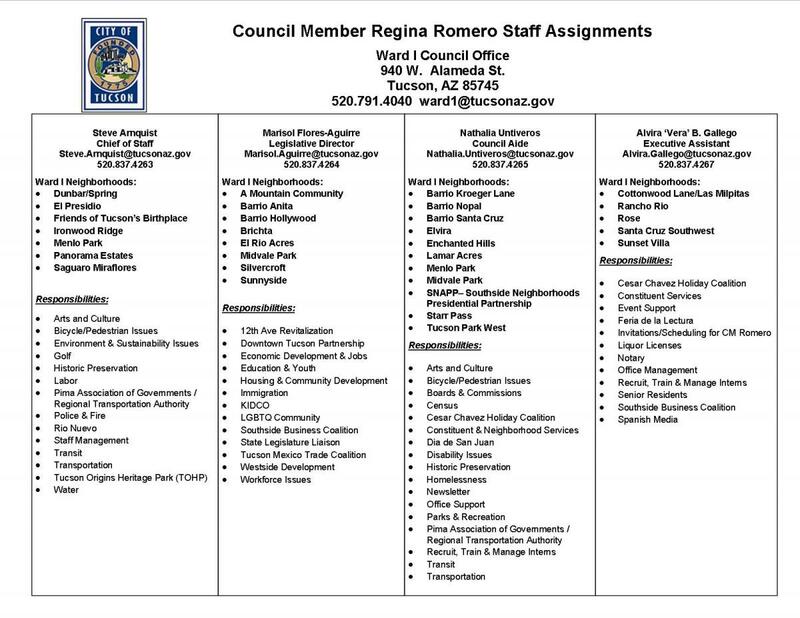 Flores-Aguirre is the newest member of the Ward I team, as the Legislative Director for Council Member Regina Romero. Previously she was the Executive Director of YWCA’s Microbusiness Advancement Center (MAC). Additionally Flores-Aguirre spent ten years in small business having worked as Director of Media & Promotions for REA Media. Marisol is the only young leader to have received the 40 under 40 recognition in Phoenix (2011) and Tucson (2016), and received the Partnership Award from the Francis McClelland Institute in 2017. She holds an Executive MBA from the Karl Eller College of Management at the University of Arizona of the University of Arizona, the mother of two children and family member of Calpolli Teoxicalli, a Nahuatl Indigenous community.